Sheepshead - thanoscardgamess jimdo page! Sheepshead is the American form of the German game Schafkopf. The deck contains 32 cards; the 2-6 of all four suits are removed. Fourteen cards are designated as a fixed trump suit. The trump suit contains the four queens, the four jacks, and the remaining diamonds. The remaining six hearts, clubs and spades are known as the "fail" suits. 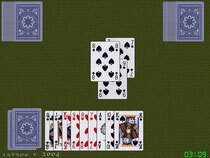 Hoyle only describes the three-handed game, which may mean that it is the original. The object of the game is to capture tricks containing 61 points or more, i.e. the majority of the points in the deck, during the play of each hand. After dealing a new hand, players establish roles that are essentially offensive and defensive. One player challenges the others, declaring intent to take tricks worth 61 points or more. If that player is successful the losers sacrifice points to the challenger. If the challenger loses, however, the "defensive" players gain twice as many points, in recognition of their upset victory.